This Dual Battery switch is a must for anyone that has 2 batteries. 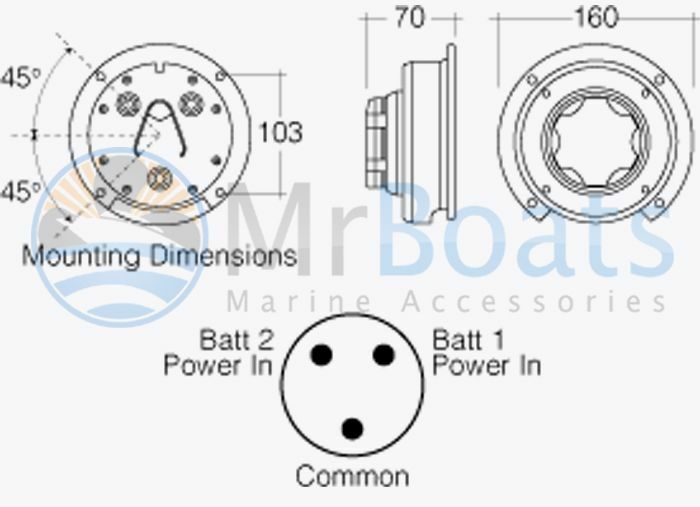 Designed for marine use but it is also perfect to use in Caravans, 4WD as this battery switch won't corride. This is our best Quality & Heaviest Duty Battery Switch. Turn Battery #1 on for when you are stopped and have your accessories running. eg Radio's, lights, tv etc. Then when you're ready to start up your boat, motor home or 4WD, turn the switch to Battery #2 which is still fully charged because no accessories have been running off this battery while stopped. Once your motor is warm and will start first crank, you stop your engine, turn the switch to both, and restart your engine (never turn the switch while your running your engine). This will then charge both batteries while your underway. At the end of the day turn the Switch to the off position. Once again this will preserve your batteries life and charge. It also acts as a deterrent to thiefs because if they go to hotwire your boat or motorhome there will be no power to the motor. These switches are high quality and a must on any boat.